CITE AS: Flo Laino, "100 Minories at CAA UK 2015," in 100 Minories, March 6, 2015, https://100minories.lparchaeology.com/100-minories-at-caa-uk-2015/ [Date Accessed: April 23, 2019]. John Layt of the 100 Minories team presented a paper entitled ‘Developing an integrated digital workflow at 100 Minories’ at this year’s Computer Applications in Archaeology UK conference, held in Bradford. This paper demonstrated the first results of an on-going 100 Symposium digital archaeology project at Minories, ‘Apps and Plugins at 100 Minories : A Hybrid Workflow’. Click on the link to explore articles relating to the project as it evolves. 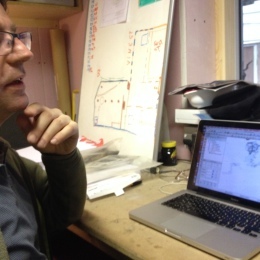 John Layt is currently developing a series of apps and plugins that aim to streamline the way in which archaeological data is digitised and transferred into our digital online database, ARK. Watch John’s presentation ‘Developing an integrated digital workflow for the 100 Minories project’ below.